Vitamin C: The most controversial vitamin? My intention in this article is not to copy all the other articles about VitC but to give you straightforward information that you can apply to fit your lifestyle. As such, it is not full of fancy charts (but there are a couple) and confusing jargon. It contains practical tips on the most efficient ways to incorporate sufficient VitC in your diet. Vitamin C has been argued over more than any other vitamin over the years. Some say large doses of VitC can stop colds, or at least clear them up much quicker, while others cry ‘nonsense’ and insist large doses go in one end and out the other with no effect other than to drain your wallet. Basic vitamin C is a water-soluble substance called L-ascorbic acid and is not expensive but there are many more expensive variations on that theme! James Lind found that citrus fruits, or even just the juice from limes and lemons, prevented scurvy and Brittania ruled the waves with this innovation (American sailors refer to British sailors as ‘Limeys’ to this day!) Lind made his discoveries in the mid- 1700s, but the active ingredient itself was only identified as Vitamin C in 1932. Vitamin C performs many functions, for example it enhances absorption of iron from plant foods, assists and recycles antioxidant activity of other nutrients such as vitamin E and holds our connective tissues and skin together. The highest levels are concentrated in eyes, brain, adrenal glands, pituitary gland and leukocytes (white blood cells, part of our immune systems). Up to a point, greater intake increases blood and tissue concentration, but once dosage goes above 1 gram (1,000 mg) per day, absorption drops to less than 50 %. Pharmacokinetic studies show that 1.25 g per day produces up to twice the peak plasma (blood) concentration of 200 – 300mg intake. Taking more than 1.25 g leads to more unmetabolized VitC being dumped in our urine, so doses of 4 or 5 grams daily, would be a waste of money. (Professor Linus Pauling wrote a book for lay people in 1970 called ‘Vitamin C and the common cold’ and he took up to 20 grams daily)!! Unfortunately, nobody else achieved such good results at controlling colds and flu as Pauling did, and ironically although he believed huge doses offered protection against many major illnesses, both he and his wife died from cancer (to be fair, they were in their 90s, so maybe their lifespan had been stretched a bit…who knows?). So, how do we know what would be the best amount to take for an optimal response for our health? I won’t seem to be very helpful here as in truth the answer is … it depends! We have RDAs or RDIs (Recommended Daily Allowances or Intakes), DRIs (Dietary Reference Intakes) which vary from country to country and some scientists support lists of SULs (Safe Upper Limits). Fruits and vegetables are the best sources of vitamin C and herbs like parsley are very high in C but hold on a minute, once again it is not as simple as that. Parsley may be rich in C but most people only consume very small amounts (if any) of it. People do however eat a lot of potato; it may be low in C but the amount we eat makes it an important contributor to our C intake. The lesson we learn here is that it’s not only how much C is in a food but how much we eat on average of that food that determines whether it is a good food source or not. Okay, usually charts appear at this point listing what is in various foods but you know fruit and veg is the best place to start so you probably already know what you should eat. A couple of pointers may be handy so please take note of these facts: Vitamin C is not naturally found in grains and cereals but many breakfast cereals have been fortified with vitamins including C so can contribute to your intake. Vitamin C is unstable when exposed to oxygen and heat so be aware that if you store fresh food for a long time the C content may have dwindled down to zero. Don’t store food for long – the fresher the better when you eat it. Frozen foods can sometimes be fresher than fresh food because they are harvested and frozen within a couple of hours and the cold preserves C levels. Heat is the enemy of C and cooking food, while very necessary, reduces C substantially; a bubbling pot of potato can be vitamin C free if kept on the heat for too long. Steaming or microwaving foods also causes some C loss but not as much as boiling in water (C is water-soluble and rapidly leaches away into boiling water). As I mentioned at the start of this article, the basic form of Vitamin C is L-ascorbic acid which is generally very cheap, but for the adventurous among you, there are many other forms of VitC that can be taken, some of which are expensive. The first step up from ascorbic acid is combining it with bioflavanoids (naturally found in the pith and rind of fruits) which help your body to absorb more of the ascorbic acid that you take, or at least that is the theory. In practise, some studies say it works and some say it does not. The evidence I have seen does not convince me, but if you take supplemental VitC and you can get a deal that includes bioflavanoids then it would not hurt to add them in. More exotic supplements include ascorbates, which have been complexed with minerals: For example calcium ascorbate or sodium ascorbate. These complexed vitamins supposedly absorb better, but although the studies I have seen generally suggest these positive effects do happen, in some cases the effect is slight and the extra expense is not worth it. As you now know, VitC is water-soluble and some scientists have postulated that although Vitamins A,D and E are fat-soluble, and take care of that side of our bodies, it would be a good thing to take fat-soluble C as well. This type of C is called ascorbyl palmitate but I think that if you are getting enough of A,D and E why spend a lot more on ascorbyl palmitate as you will probably not gain anything other than another drain on your wallet. Food state supplements or True Food supplements are vitamins and/or minerals complexed with food. The idea behind these is that the body digests and absorbs nutrients from food and taking supplements is a synthetic experience where only a small amount is absorbed. Typically these supplements are foods such as brassica family (cabbage) grown in hydroponic tanks (water) that are fed a vitamin/mineral mix while they grow. As they are so digestible much lower potencies of each nutrient do the job. The other major ‘food’ used is saccharomyces cerevisiae a type of brewers yeast and again small doses supposedly outdo large doses of synthetic supplements. 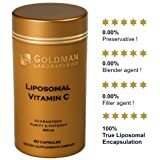 The latest C supplement is liposomal vitamin C. Again, it is more absorbable, easier on the digestive system etc. etc. (as above) and is more expensive. Would I recommend it? Well, it does have studies that vouch for it but it is too new to have any longer- term studies behind it so I would stay and favour the older supplements. A serious deficiency leading to scurvy is almost unheard of these days but subclinical deficiencies can be found in several categories of patient: Alcoholics; drug addicts; mental illness (such as anorexia); elderly people on their own who struggle to prepare food or even to buy food and extreme food faddists that restrict their food intake excessively. Severe absorption problems in the intestines such as cachexia can cause deficiency even when the dietary intake is more than enough. Cancer also drains C from our bodies due to the severe oxidative stress experienced. Renal (kidney) failure leading to hemodialysis is another difficult area. Finally, remember we are all individuals (even more so as PD people) so a bit of experimenting with your dietary intake may surprise you. Most of the above relates equally to PD people and non-PD people, good health is important to us all. In my last article on nutrition for our blog I said vitamin C and D would be featured this time but I think this is enough for one day; D will appear next time! Previous Annual Forum 18th November 2017 at The Link Hotel, Loughborough. Next Vitamin D: Dangerous friend or generous foe?